Dupondius, struck 72-73 AD in Rome. Obv. 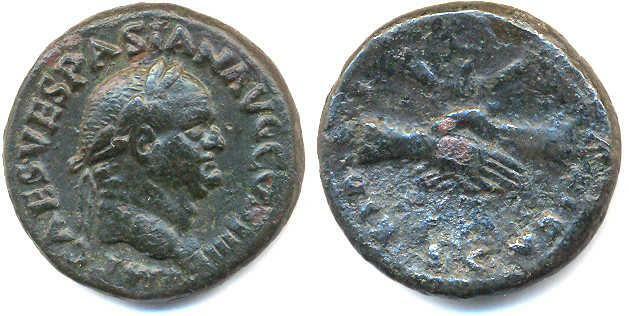 : IMP CAES VESPASIAN AVG COS IIII, Vespasianus head, rad., r. Rev. : CONCORDIA AVGVSTI / S C (ex. ), Concordia seated l., r. holding patera, l. cornucopiae. Rev. : PAX AVGVSTA / S - C, Pax stg. l., r. holding branch, l. caduceus. Rev. : ROMA / S C (ex. ), Roma seated l. on cuirass, r. foot on helmet, r. holding wreath, l. parazonium. Rev. : ROMA VICTRIX / S C (ex. ), Roma seated l. on cuirass, r. holding wreath, l. parazonium; behind, shields. Rev. : FIDES PVBLICA / S C (ex. ), clasped r. hands holding poppy and two corn ears. Obv. 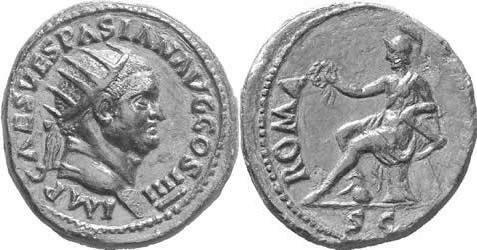 : IMP CAES VESPASIAN AVG COS IIII, Vespasianus head, rad., r., with globe.